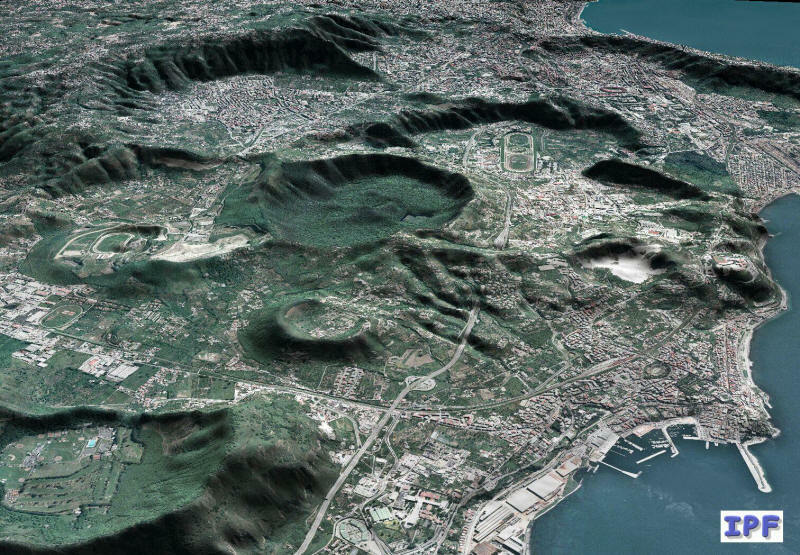 Campi Flegrei is a large 13-km-wide caldera on the outskirts of Naples that contains numerous phreatic tuff rings and pyroclastic cones. Episodes of dramatic uplift and subsidence within the dominantly trachytic caldera have occurred since Roman times. The earliest known eruptive products are dated 47,000 years before present (BP). The Campi Flegrei caldera formed following two large explosive eruptions, the massive Campanian ignimbrite about 36,000 years BP, and the >40 cu km Neapolitan Yellow Tuff (NYT) about 15,000 years BP. Following eruption of the NYT a large number of eruptions have taken place from widely scattered subaerial and submarine vents. Most activity occurred during three intervals: 15,000-9500, 8600-8200, and 4800-3800 years BP. Two eruptions have occurred in historical time, one in 1158 at Solfatara and the other in 1538 that formed the Monte Nuovo cinder cone.